Do you want to reach over 3,000 haunted attraction owners and operators? 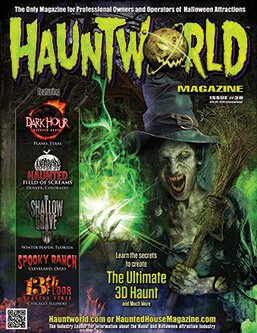 You can thru Hauntworld Magazine. Plus, all our magazine advertisers additionally receive online advertising oppotunities for FREE. The web traffic from HauntWorld.com and HauntedHouseMagazine.com is second to NONE in the haunt industry with over 9 million visits last year! HauntWorld provides THE BEST information for the haunt industry. Is your business ready to reach a ONE BILLION DOLLAR INDUSTRY? There are TWO ways to market your business throught Haunted House Magazine and our system of websites including Hauntworld.com. Please click on our new 2019 media kits to reserve your space TODAY! Marketing Your Supply Company. Advertise with HauntWorld Magazine. Marketing for Haunted Attractions. Purchase Featured Banners and Listings. Do you want to place banners for movies, or products on Hauntworld.com? Tap into the biggest and fastest growing amusement industry today! The Halloween Attraction industry is now a ONE billion dollar industry attracting millions upon millions of guests each year, spending hundreds of millions of dollars to create and market their business. The Haunt industry is looking to grow their business by finding new technology, expanding retail and concessions, or simply looking for new services to increase revenue and productivity. The biggest growth is creating new attractions to operate year around including Christmas to Escape Rooms. The all-new Hauntworld Magazine now covers Escape Rooms, Zombie Laser Tag, Christmas Attractions to anything haunt owners might operate as an attraction. When you market to the haunted house industry, you reach direct to the decision makers with 100% purchase power and HAUNTWORLD is your source! Hauntworld.com is the World’s #1 Haunted and Halloween website. Hauntworld helps people around the world find everything about the haunted attraction industry. Hauntworld features the only online vendor directory, allow people to find business’s by category type. Some of the vendors listed have tens of thousands of views on their profiles helping them locate new customers. All vendor listings are free, but featured vendors are located on page 1 with unlimited category listings. Hauntworld also features the largest email data base with nearly 100,000 amusement attraction direct contacts. Hauntworld also promotes your business on our Facebook page which has over 600,000 followers. Our Youtube page features over 1 million views, with nearly 4,000 subscribers. Between the online directories, the forums the magazine subscriptions, direct emails for amusement facilities, escapes, to haunts, Hauntworld’s database includes over 95,000 attraction owners and operators. Fright Forum Averages over 1,500 visitors per day and nearly 3 million page views a year. Nothing on the web can match our performance. 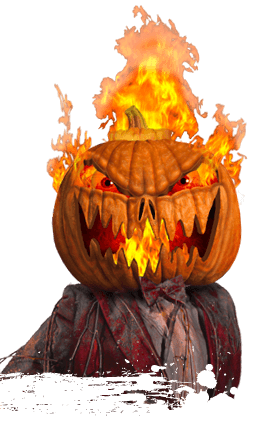 Haunted Houses, Corn Mazes, Amusement Parks, Family Fun Centers, Renaissance Fairs, Pumpkin Patches, Haunted Hayrides, Ghost Tours, Escape Rooms and Haunted Attractions. What do Halloween Attractions buy? • Insurance, Ticketing, Integrated System and much more. The Haunted House industry is now a ONE billion dollar industry attracting millions upon millions of guests each year, spending hundreds of millions of dollars to create and market their business. The Haunted House industry is looking to grow their business by finding new technology, expanding retail and concessions, or simply looking for new services to increase revenue and productivity. When you market to the haunted house industry, you reach direct to the decision makers with 100% purchase power. 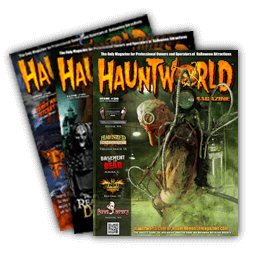 Unlike most industry magazines, Hauntworld Magazines are collected by haunt owners, not thrown away, and are a strong source of information to help owners expand and grow their business. 1. Leaderboards, Banners & Skyscraper Ads on our websites including banners embedded into the FORUMS posts. Online ads will appear on ALL these sites: Hauntworld.com, HauntedHouseOnline.com, HauntedHouseMagazine.com and HauntedHouseAssociation.org. 2. We send Mass Emails each time we publish a new Magazine. Mass emails will include all advertisers emailed to over 95,000 amusement attraction operators and owners. 3. Online Vendor Directory: Your company will be a featured Vendor and you will receive a page-1 Featured Company Profile inside our FIND HAUNT VENDORS vendor directory. Banners will be placed on within the directory. 4. Facebook: NEW POLICY! Any and all advertisers can send us a video or picture of something cool and we'll publish it. If you're running a sale send it over we'll publish it. All vendor videos from Transworld show will also be uploaded to youtube. 5. Youtube Page: 4,000 followers, Over 1 million views. We create vendor profiles and upload them to our youtube page some of those vendors videos have over 5,000 views each. 6. Featured Vendors: Hauntworld will start to feature vendors in the magazine. If a vendor wants to purchase an article about their company which would include publish online $1000 must be in combination with an ad. Includes a Featured Vendor Article published online and in the magazine. company published online and in the magazine. 1 Featured Banner in Vendor Directory along with Featured Profile in same. - 1 Featured Banner in Vendor Directory along with Featured Profile in same. commit to 1 year marketing. updates about your company. $500 first banner / $250 each additional. #3. Mass Email: Cost $2500 for one mass email to our entire data base. #4. Vendor Featured Article: $1000 with full page ad or $2500 without. Published online and in magazine. You’ll need to submit the online ads too. Release: January 2018 It will highlight tradeshow news, dates, seminars & events, plus featured haunted houses, and how-to articles. Pre-Release: March at Haunt Show 2017 Additional magazines are printed and distributed during the Transworld Haunt Show. Log in today to www.hauntworld.com/haunted_house_suppliers/index.cfm and create your company profile on the biggest Haunted Attraction based website in the World. Over TEN million visitors used our systems last year to find everything from vendors to haunted houses. Create a FREE Company Profile today! Ticketing Solutions, Insurance, Marketing & more. There are 2 main webpages per Vendor Category. Free Company Profiles are found on page-2. Categories to further impact your business. Log onto www.HauntWorld.com today and click on our Find A Haunt Vendor page and create or update your Company Profile within minutes.